These adorable, smushed-together buildings are all over the city. I wanted an ~8-hour layover in Amsterdam so I booked a flight on the American Airlines 757-200. Unfortunately, the plane was hours late taking off, leaving me with only a 4-hour layover in Amsterdam. 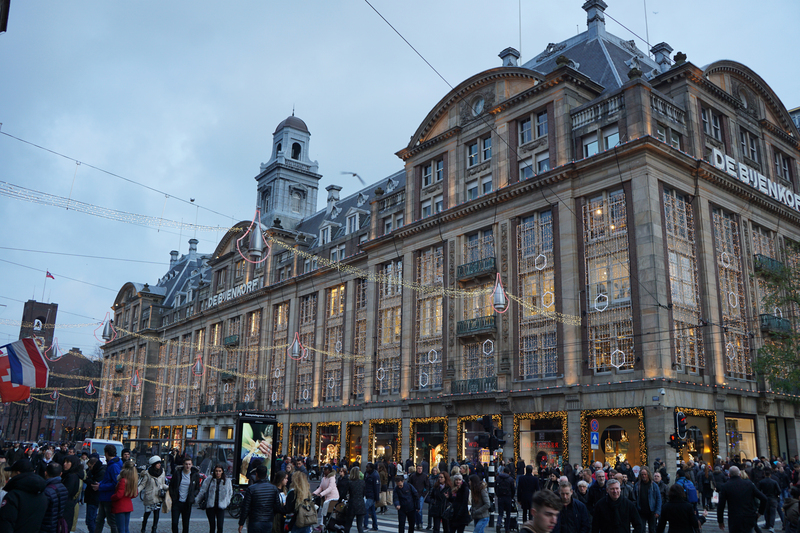 De Bijenkorf–a large shopping mall in a beautiful building. As the sun set, it became easier to see the Christmas lights. 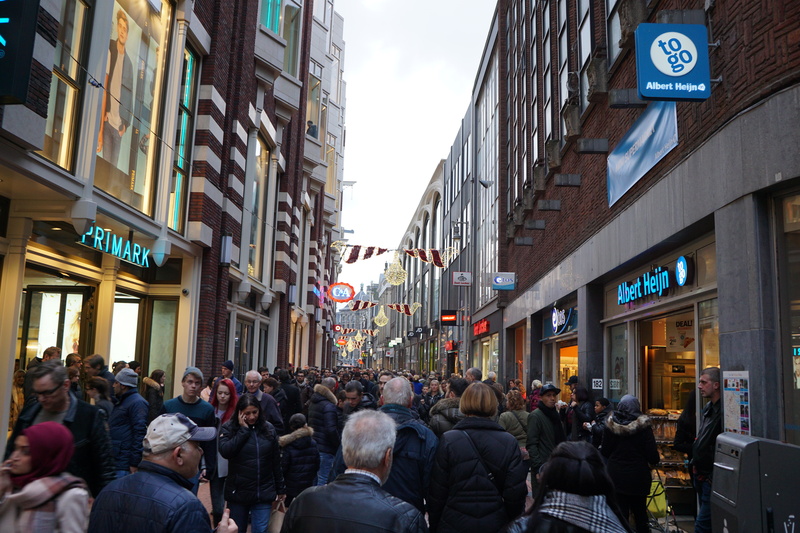 Traveling from the airport to downtown Amsterdam was easy. 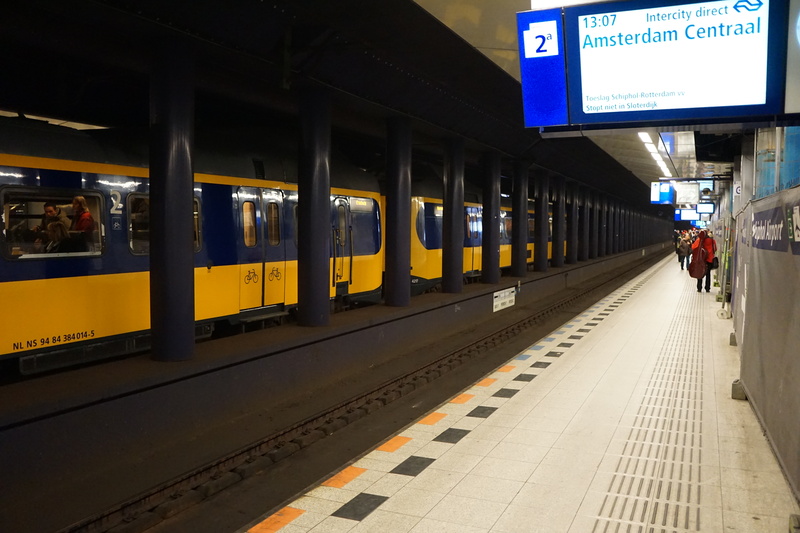 I paid $7.33 USD to put my carry-on luggage in a locker (basement of AMS) for the day and $9.95 USD for a round-trip train ticket to Amsterdam Central Station. My credit card would not work at the train ticket kiosk so I had to buy a ticket from an attendant at the ticket counter. I waited about five minutes for the train. 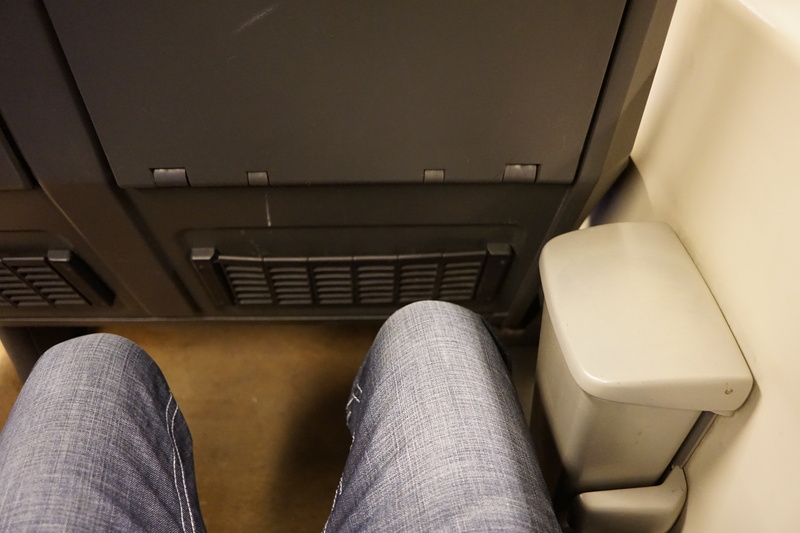 Legroom was ample for the short trip. 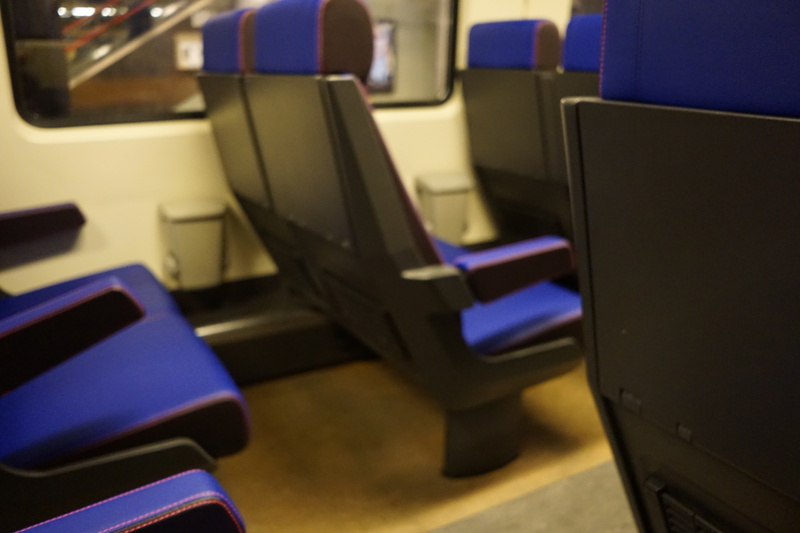 I was surprised to see that each seat had a little trash can mounted to the wall. The cabin was laid out in a 2-2 configuration, with enough room for two people to stand side-by-side in the aisle. All the bikes. The overwhelming majority of people walked or rode bicycles. Some folks drove, but navigating the roads was difficult given that bikers had overtaken the city. There were several bike rental stations in/ near Central Station. A 3-hour bike rental cost around 11 Euro (approx. $12 USD). The canals were navigable but I mainly saw tour boats (as opposed to commuters) in those boats. 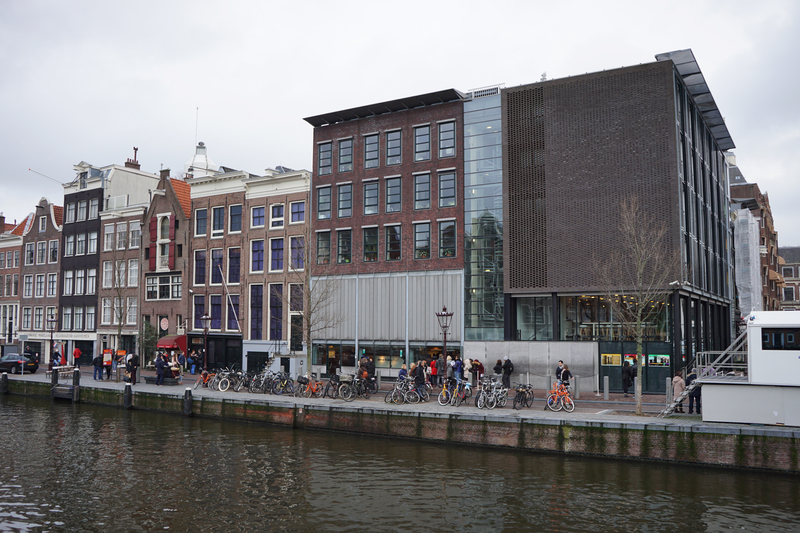 If you want to visit the museum at Anne Frank’s house, make a reservation ASAP. Tickets are 9.60 Euro (approx. $10 USD) per adult and they reserve you an entrance time between 9am – 3:30pm. Entrance times from 3:30pm – 7pm (close) are sold onsite at 3:30pm, meaning people line up hours beforehand to try to secure a ticket. From April-October and on Saturdays the museum is open until 10:00pm. Not pictured: the huuuuge line of people without reservations. You do not want to be one of those people. Apparently Amsterdam is famous for its flowers. 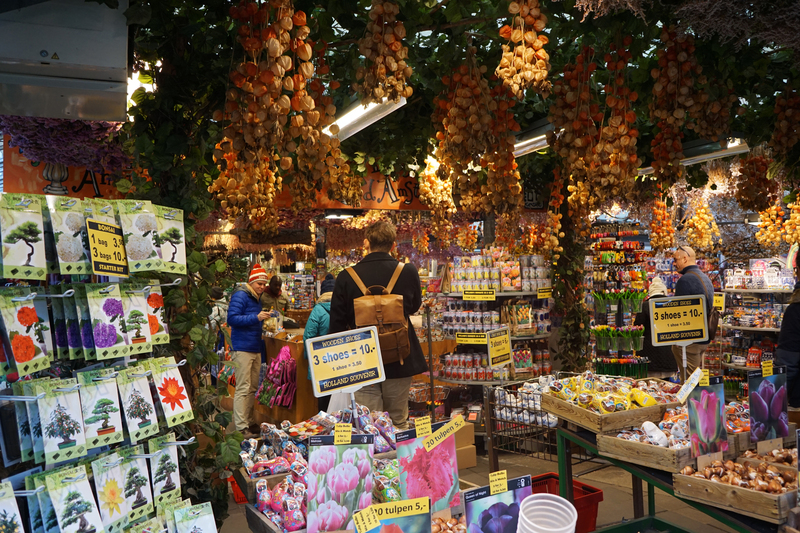 I came across this flower shop that sold all kinds of bulbs. The presentation was impressive, it was one of the most-colorful stores I had ever seen. Stins, located at the corner of Muntplein and Singel. The fast food selections included American staples–Starbucks and McDonald’s. Almost every restaurant/ bar advertised the availability of Heineken. 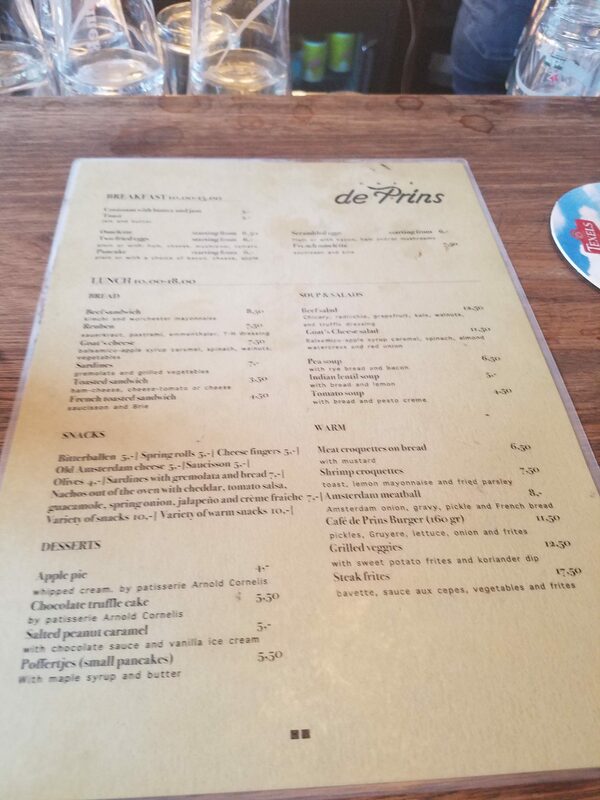 I found a little hole-in-the-wall place near Anne Frank’s museum, called de Prins, to grab food. Beers cost around 5 Euros (approx. 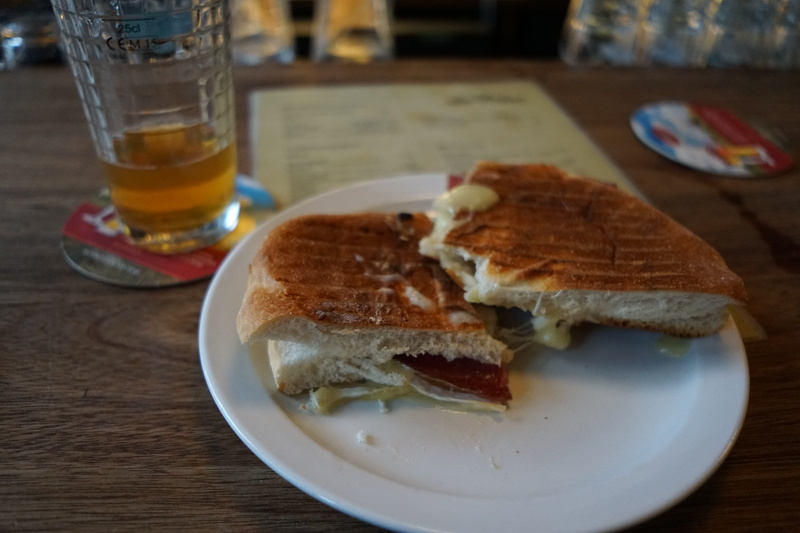 $5.50 USD) and sandwiches were 5-12 Euros (approx. $5.50 to $13 USD). My pressed French sanwhich with brie coast 4.50 Euro (approx. $5 USD). 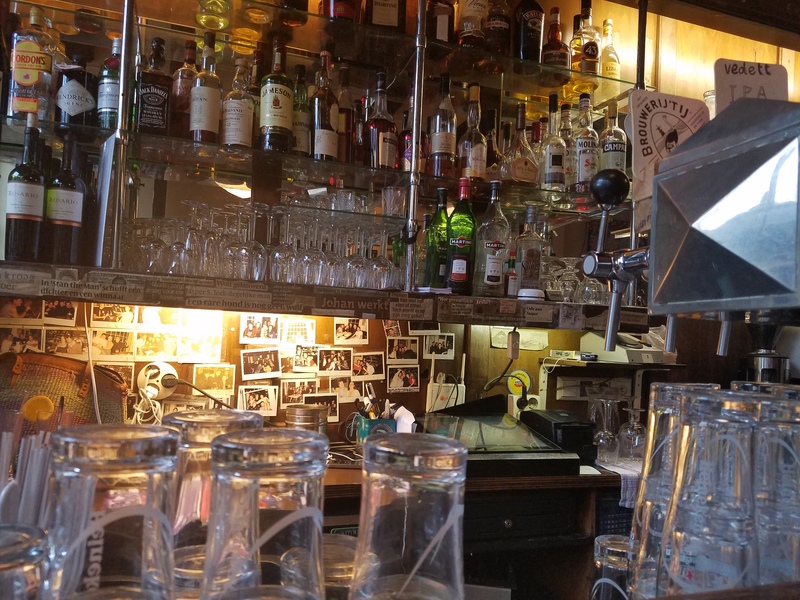 I sat at the bar which was cozy. The folks sitting next to me were traveling from Minnesota–fellow Midwesterners. The husband worked for Delta and was excited to tell me that they flew business class to Europe. The meat was not very good but the brie was delicious. The IPA featured pine- as opposed to citrus-flavored hops. If you could not tell, I am a millennial. 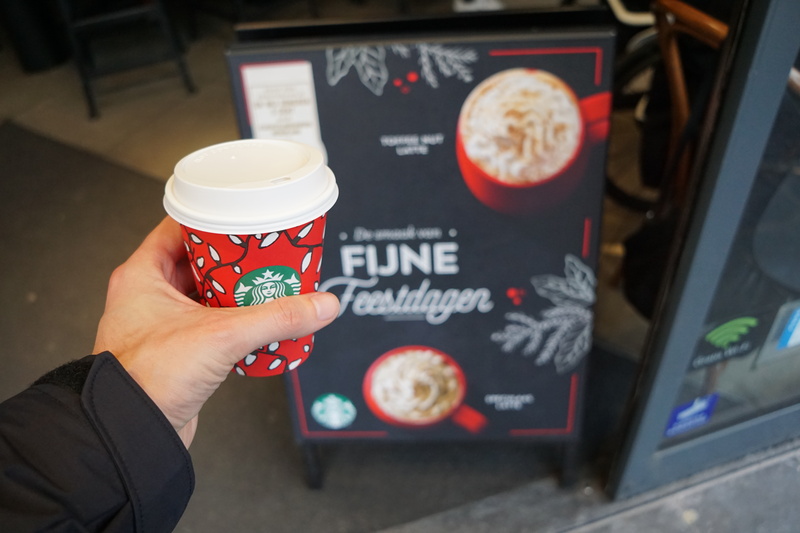 I had to try Starbucks’s Speculaas Latte, which I had not come across in the U.S. It tasted like a slightly sweet chocolate/ caramel latte but it was not good enough to get again. I was impressed that the attendant wanted to make sure she spelled my name correctly. The customer service in Amsterdam was top notch, much better than I receive on a daily basis in the District of Columbia. Amsterdam was an adorable city and I will definitely return. Transportation from the airport to downtown was cheap and easy, making it an excellent city for a short layover. 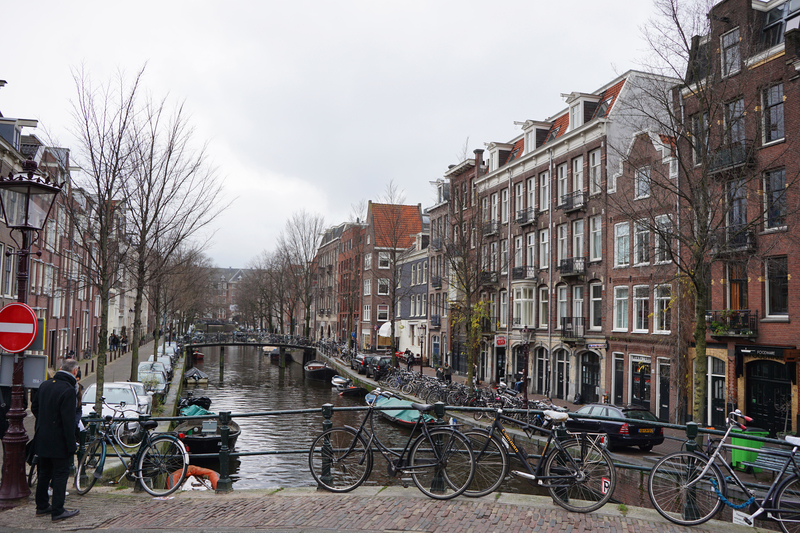 4 Comments on "Amsterdam: 4-Hour Layover"
This was helpful! I have a 4 hour layover coming up in July — do you need to go through immigration to get out of the airport or go through any specific process, or can you just leave and come back as long as you have your boarding pass? Also, how early did you get back to the airport before your flight?